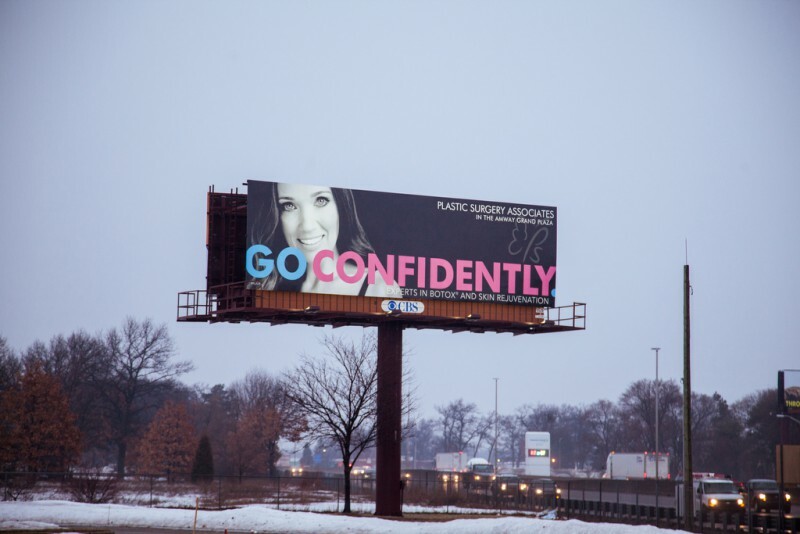 Is it just me or has anyone else noticed the "Go Confidently" billboard ads that suddenly popped up all over the highway and near highway entrances around the Grand Rapids, Michigan area? Anyone who would like to participate can stand with us at the billboard ad on 28th street near the ramp entrances to Highway US-131. We'll be holding up the "Love Yourself" posters and waving to cars as they pass us! Contact me for more information about how to get involved or if you'd like to get YOUR photo taken for the positive body image movement! The photo of the woman smiling got my attention the first time right away. What else got my attention was the bold lettering of "Go Confidently." I really loved that slogan. I thought to myself "what a great message." However, once I read further I was a little shocked. "Experts in Botox and Skin Rejunven--what did they just say?" An ad that is describing to women to be confident, and then follows that up with suggesting Botox? Seems like an oxymoron. As I began to analyze the ad further, I became even more annoyed. They used a pink color for the "Confidently" text. I couldn't help but wonder if they used that color to play off of people's associations with the color pink and breast cancer awareness. Very clever to get people to look twice at a billboard if that was their thought process. As days went on, I drove past this ad every day to and from work. I also drove pass several others during my commute. Keep in mind my commute is only a seven minute drive. That's how many of these billboards are out there right now on a small stretch of highway. I kept seeing these over and over each day and became more annoyed by them every time. I disliked the message they were sending. "My confidence has nothing to do with you," I would say out loud in my car directed solely to the billboard. Let me digress by saying I do not have problem with certain types of plastic surgery. There are procedures that help reconstruct people whom have been in horrible accidents, those who have clef palettes or even people who have a pregnancy that went badly. What I do mind are ads like these that target and play on women's insecurities. This billboard is the last thing a women wants to see in the morning when they are going to work and the last thing they want to see when they are finished from a long day at the grind and headed home. We already have insecurities and things we may not fully love about our body - we don't want an ad staring at us from 100+ feet in the air on a huge billboard reminding us of our body's imperfections. Why am I so irked by these ads? Well, I had a lot of body image issues that came about because of many reasons - the most important reason was the syndrome I was born with. I was born with a syndrome called Beckwith Weidemann - where the whole side of my body was larger than the other - the organs, the bones and the muscles...everything. I was very embarrassed as a kid and I had to go to lots and lots of doctors. But, did my parents get me plastic surgery as quick fix right away? No. I went through physical therapy for 12 years, lots of doctors appointments and I learned how to live with it. I was lucky to have had a form of the syndrome that wasn't as severe. But, if what I had was worse and after 12 years of physical therapy and appointments my quality of life hadn't improved...well I may have needed plastic surgery to be able to live a better quality of life. I am sure they would have made decisions then. If plastic surgery is done to help someone to better function physically in daily life because they cannot function physically otherwise...then yes, plastic surgery is helpful. These ads, however, do not serve that intention. That's not a message I want support. That's not a message I want to tell others. Therefore, I decided to do something about it instead of just feeling annoyed. For those who don't know, I work as a photographer. I am an owner of The People Picture Company. I take photos for a living of people and events. On Monday, March 17, I put out a request asking if any woman would be willing to be photographed to show other woman that everyone is different, but we are all beautiful. I told people they could bring their friends with them to the studio and we could all just sit and chat about life and what everyone else thought about these ads. The idea was to be ourselves, natural and real. This open call for participants started first as a Facebook message to multiple people, then a Facebook status. The response was astounding! Within a day, I had booked seven photo shoots with women who would let me take a photo of themselves to what my friend Noelle and I deemed was a Go Boldly campaign. Noelle came up with the slogan. Let me just credit her right now. My first attempt at the slogan was Embrace Your Body. Now I have about 12 photoshoots booked with women of all different ages - 60, 55, 50, 40s, 30s, 20s. I am ecstatic and excited to photograph the beauty in each and everyone woman! As the day went on today (Tuesday, March 18), I began to think of another idea. What if we printed one of our Go Boldly ads as big as could. Then, we could stand next to one of the GoConfidently Billboards and promote positive body image. I chatted with my friends Audrey and Colleen and we formed some great ideas. Colleen came up with a wonderful new version of our ad and I designed it. Our idea is with this design people will see the GoConfidently ad above, then see our ad and it will bring a smile to their face. We want to make them happy and love everything about their bodies. This will serve as a reminder to love yourself. 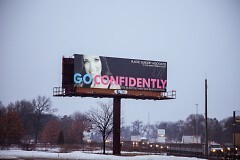 We will be standing by one of the GoConfidently billboards next Friday, March 28 at 4 p.m. I cannot wait to see what happens. My hope is that this only brings positive thoughts to people as they leave from work for the day or come home from picking up their kids. If you'd like to get involved with our Go Boldly campaign - email me. We would love to see anyone who wishes to get involved!